We were pretty hard on Joe Girardi during the playoffs, because we believed the way he handled Alex Rodriguez was a sign that he'd panicked. We believed he was basing his decisions on small sample sizes and that he'd bought into the idea that A-Rod is a choker who doesn't deserve to hit in big spots. And so when word broke yesterday that A-Rod was playing hurt in the postseason and will require surgery on his left hip, it complicated matters: Girardi, we figured, might have been factoring that in when making his decisions, and weighing the potential effectiveness of an injured A-Rod against the the alternative. But now that we know a bit more about the timeline of events, we're as confused as we were when the playoffs ended. • In Game 3 of the ALDS, Joe Girardi told Alex Rodriguez he was pinch-hitting for him. It was only then that A-Rod told his manager that he thought his right hip needed to be looked at. To that point, he hadn't complained about discomfort or received any treatment. 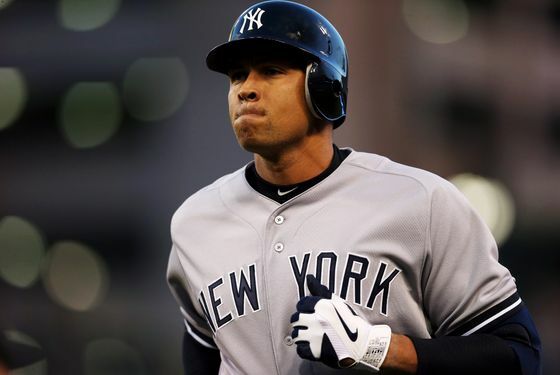 • After that game, A-Rod went to the hospital for an MRI on his right hip, and it came back clean. • Once they had those results, the Yankees weren't very concerned about A-Rod's health. Says Cashman: "So he went down to Baltimore and continued the decision-making process of when to play him, not play him. But we felt comforted that he was clean on the exam on his right hip, which is what he raised to Girardi in that dugout that day. And we moved forward. As a player that was available to us and at full go." We believe Cashman actually misspoke there: The Yankees didn't return to Baltimore after Game 3, but that's besides the point. • The issues with the left hip weren't discovered until after the season, when A-Rod went to Colorado to be looked at by a doctor there, as he does every winter. So the decision to pinch-hit A-Rod the first time was made before Girardi knew anything about any discomfort or potential injury, and as Cashman tells it, they understood A-Rod to be "available to us and at full go" once the results of that MRI came back. Whether that's entirely true is up for debate: Girardi at least knew at this point that something was bothering Rodriguez, even if he didn't believe he was seriously hurt. But one gets the sense from Cashman's quotes that A-Rod's injury wasn't a big factor in how they treated A-Rod, which means all the stuff about small sample sizes and believing that A-Rod is a just a big choking choker still holds up. This is unfortunate. Girardi, if nothing else, was once a very predictable skipper, but who's to say he won't panic-manage this team again at some point the way he did in October? A-Rod's injury means a bunch of things to the Yankees going forward, but they're all fairly obvious: His skills are declining and his body is breaking down as he ages, and his huge contract will handcuff them as they try to assemble a roster. They need depth at third base in the short term while he's on the DL, and they need it in the long term as well, because who knows what he'll be able to give them when he returns, or how long he'll be able to stay healthy. But you knew all that pretty much immediately yesterday. What wasn't clear right away was whether A-Rod's injury would change how we look at Joe Girardi these days. Based on what we now know, it hasn't — at least not much.